Shaded by live oak and sycamore, Monrovia Canyon Park is delightful retreat, complete with a little waterfall and a nature museum. And the park, perched just above Monrovia in the foothills of the San Gabriel Mountains has been welcoming hikers for 100 years. Not that I or anyone else needs an excuse to hike Monrovia Canyon, but the idea of tramping a 100-year-old trail combined with a beautiful autumn day prompted The Trailmaster to motor along the Foothill Freeway to Monrovia. Myrtle Street—Monrovia’s main thoroughfare—was closed-off this day so I improvised a route through a lovely old neighborhood. Monrovia has a lovely neighborhood of Craftsman homes located near downtown and near hiking trails. 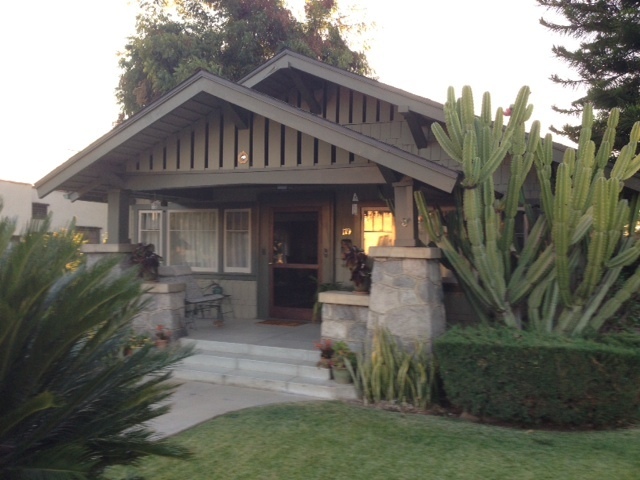 Monrovia has a wonderful neighborhood of Craftsman houses built about a century ago. Many of the bungalows have been lovingly restored. I love that era. The McKinney family lives in 1912 bungalow in Santa Barbara’s Bungalow Haven neighborhood. I imagine early 20th century Monrovians lacing up their hob-nailed boots and hiking from their bungalows up to Monrovia Canyon Park. Apparently there’s still a nice connection between town and country. Locals say the fountain in the middle of town (by the library) is the start of the 7-mile long Fountain to Falls Hike. Sounds fun. 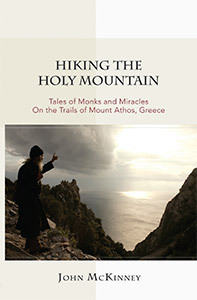 I’m putting that on my “To Hike” List. 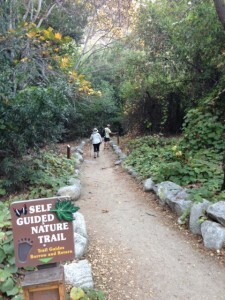 Monrovia Canyon Park preserves its namesake canyon as well as one other: Sawpit Canyon. At the junction of these two canyons was once a sawpit. Two sawyers, one standing at ground level, the other in a pit, operated the huge hand-saws of old. Sawing logs might have put the canyons on the map, but it was water that attracted civic attention in the 1880s. William P. Monroe’s new city of Monrovia wanted the water and built a reservoir. L.H. Emerson wanted it, too, and a court battle ensued. City Hall won. Eventually, the name Monrovia was applied to a canyon, a peak and a park. Emerson had only a flat named after him. For more than a hundred years Monrovia Canyon has been a popular picnicking area for San Gabriel Valley residents. Early Monrovians built a road to the park, which they dedicated in 1913. 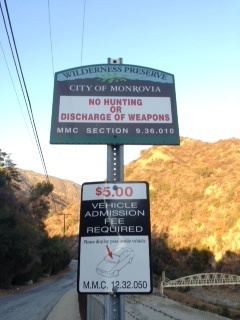 Enjoy Monrovia Canyon but bring along $5; dozens of park signs remind you to pay up before you take a hike. “If you’re going on a hike, you need to pay for parking,” a park aide greeted me just seconds after I emerged from my car at the nature center. Centennial or not, this storied canyon is a great place for a little hike BUT there are a few minor downsides: The park has posted way too many $5.00 parking fee signs; enough already, we get the point. (BTW, you can park for free in the residential area nearby and walk 0.6 mile to the park entrance.) 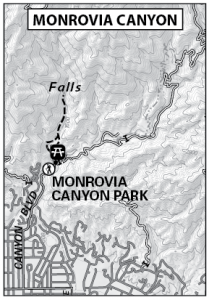 Monrovia Canyon has limited hours (8 a.m. to 5 p.m. weekdays, 7 a.m. to 5 p.m. weekends), and the canyon is often crowded with high traffic on the trail and 20 or 30 people or more clustered at the base of the falls. Waterfall Trail is a short one (1.5 miles round trip with 200-foot elevation gain). The pleasant goal of this stroll is a two-tiered waterfall, which cascades into a oak- and spruce-shaded grotto in the midst of Monrovia Canyon. Hikers can extend their adventure a bit by joining the park’s nature trail. I also like the hike (6.5 miles round trip with 1,100 elevation gain) from Monrovia Canyon Park to Sawpit Canyon and Deer Park. But let’s save the story of that hike for another day. Directions: From the Foothill Freeway (210) in Monrovia, exit on Myrtle Avenue and proceed two miles north. Turn right on Scenic Drive, jogging right, then left, and turning north on Scenic as if becomes Canyon Boulevard and continues another mile to the entrance of Monrovia Canyon Park. 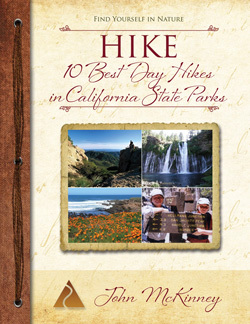 Signed Waterfall Trail begins opposite the Mal Parker Mesa Picnic Area near the park’s small nature museum. 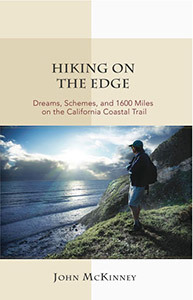 The Hike: Before you descend into the canyon, look behind you at the distinct V-shaped gorge, which frames a pie-shaped view of Monrovia and the San Gabriel Valley. Waterfall Trail descends to the canyon bottom where you’ll see the park’s trail heading down-canyon. But you head up-canyon on the shady, creekside trail, which passes a series of check-dams. The cascade of the little falls, mingled with the murmur of the creek, is restful music to the ears.